One of the best basketball players of all time, Kobe Bryant is setting out to make a name for himself in show business—and succeeding, having already won an Academy Award, for his short film Dear Basketball. His latest entertainment venture, a podcast called The Punies, made a stop for a live broadcast at the Children’s Hospital of Orange County (CHOC) on Monday. 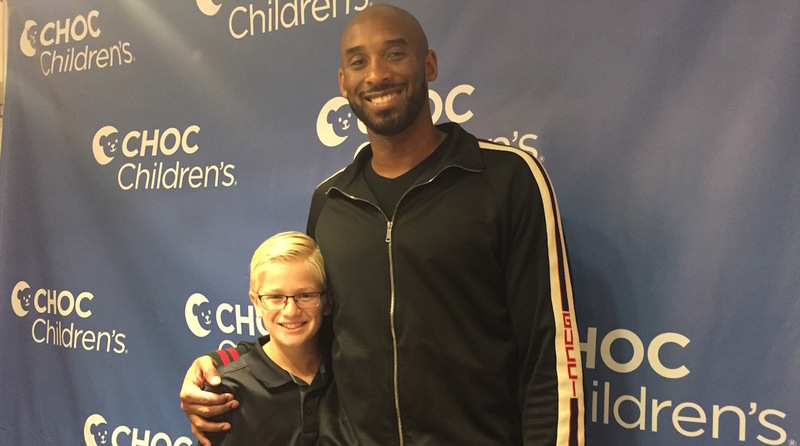 Young patients, wheeling IV carts and clothed in soft hospital gowns, crowded into Seacrest Studios, an in-house multimedia broadcast center, for a chance to meet the NBA superstar and listen to a brand-new Punies episode. In the podcast, a cast of six portray the “Good Ol’ Gang," a diverse group of friends drawn together by their love of sports and days of adventure. With distinct voices created by seasoned actors, the episode entitled “Trust Your Crew” told a colorful story of Puny Pete (played by Ry Chase) facing his fears while entering a Soap Box Derby race with a car built by his friend Lilly (Rebecca Galarza), who forgets to install the brake. "Puny, the main character, is dealing with a lot of things this first season: the fear of fitting in and the fear of sports in general," Bryant said. "And you see his teammates trying to support him in various ways." Counting on parent-to-parent word of mouth to grow the audience, Bryan also let slip that The Punies is going to be an animated series in the near future. Airing every Saturday morning for an initial 10-week run, find The Punies Podcast on Apple Podcasts, Google Play Podcasts, Stitcher, TuneIn, Spotify and iHeart Radio.